A prolific competition shooter with 24 USPSA National Championships and 7-time IPSC World Champions. First things first - a Springfield terminology lesson. Springfield Range Officer® - a 1911 with a minimalist modification package offering basic features for competition. Springfield Operator® - a firearm featuring a frame designed with integral accessory rail, allowing mounting of lights, lasers, etc. 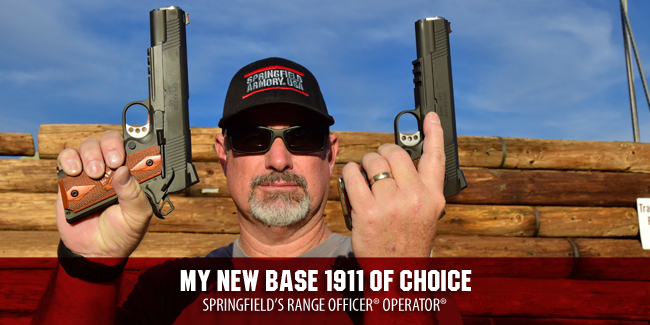 Springfield Range Officer® Operator® - a 2016 new product and my new base 1911 gun for competition. 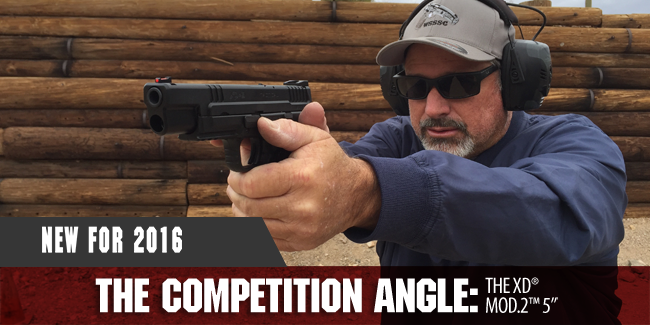 The Competition Angle: The XD® Mod.2™ 5"
As a competition shooter, I always want to know how well a gun will function in a performance environment. Sure, self-defense and daily-carry use are also performance-intensive, but where I need most of my guns to excel is in a controlled, scored, organized, competition environment. That’s how I measure performance. 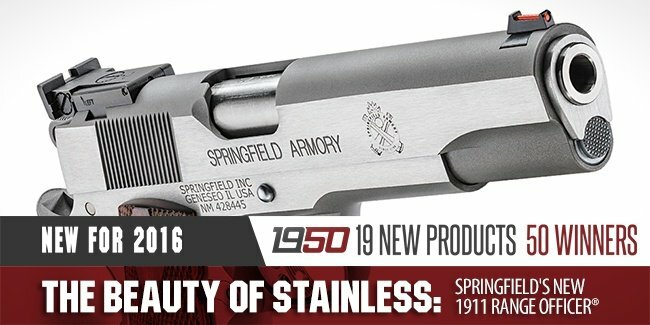 If you love the look of stainless firearms and the tarnish- and rust-resistant features of stainless steel, the finish is now readily available in the Springfield Armory® 1911 Range Officer® (RO) pistol line. If you’re a gun collector or enthusiast like I am, you know that picking the best firearm to meet your particular needs can be a difficult process to wade through. When you pit two or more potential models against each other, what should you look for? And here it is - the all-new XD® Mod.2™ 4” Service Model with GripZone®! Hot on the heels of the 3” Sub-Compact Mod.2™, the Service Model chambers the increasingly popular 9x19mm cartridge and utilizes the same 16-round magazine as standard XD® models. And just like its little brother, the "New Guy" gets the new Mod.2™ look and feel. Let's check out the slide assembly. So that's the top half of the story - what about the frame? 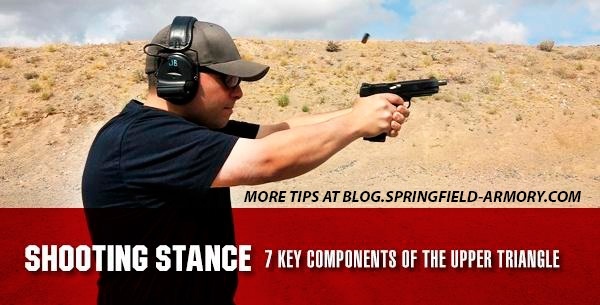 Midsize Face Off: 1911 Range Officer® Champion™ vs. XD-S® 4.0"
My personal definition? It’s larger than the smallest and smaller than the largest. Yeah, I know it’s a smarty-pants answer. But it is a good way to define it. Midsize pistols are among the most popular in the handgun market because they offer a greater range of versatility than either full-size or sub-compacts. But since there are so many midsize pistols from which to choose, you have to base your purchase decision on what you want to use your pistol for. To illustrate this point, let me show you how I evaluate two of Springfield Armory®'s flagship midsize pistols in a head-to-head comparison. The two pistols that I'll compare are the 1911 Range Officer® (RO) Champion™ and the XD-S® 4.0" pistol. Different look. Same great rifle. The M1A™ Loaded Precision Adjustable Stock (PAS) rifle is now available in your choice of two stock and hand-guard colors – the fan-favorite Flat Dark Earth (FDE) and the tried and true classic black. I routinely see a competitor's upper body move back and forth when shooting. This is caused by the force of the gun kicking / recoiling, and the constant weight shifts and corrections made by the shooter to compensate. It is nearly impossible to shoot a sequence of shots quickly and accurately if your torso is constantly moving. Heck, it's hard enough to do when everything is perfectly still! If you wait until you stop moving backward and then lean forward again to return your upper triangle into shooting position before you can align the sights to shoot, you will never be fast or accurate. Last week we covered the "Upper Triangle" of a shooting stance, this post explores "Torso and Leg Positioning". Let's go. We all were told at some point in our training to "relax, squeeze the trigger slowly and let the gun kick freely". 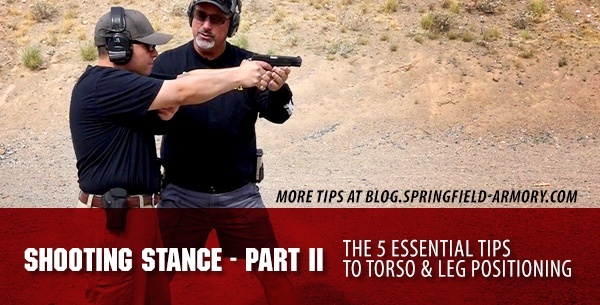 This makes sense when you're just starting out, but if you want to shoot faster and maintain a high degree of accuracy, this basic advice will have to evolve. You will have to do things differently. That's where shooting stance comes in. It's one of the most important fundamentals of being a faster, more accurate shooter. Stance covers everything from the ground to your gun (literally). A proper shooting stance has a lot of elements involved. For sake of simplicity I'll separate stance into two parts. The "Upper Triangle" and the "Torso and Legs". This article is devoted to the "Upper Triangle", which is your hands, arms and shoulders. To me, the 1911 is the best handgun design of all time. The new Springfield Armory® MC 1911 Operator® is the epitome of a multi-use, heavy duty 1911 pistol. It has all the features you need and is improved with a trick set of G10 grips and our new OCTO-GRIP™ scalloping pattern on the front strap. Equipped with our loaded package of high visibility self illuminated night sights, ambidextrous thumb safety, speed trigger, hammer and beavertail style grip safety, it may be the perfect tactical .45 ACP pistol.